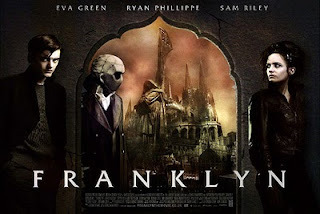 Been busy doing (attempting) screenwritery stuff, but I found time to throw up a few thoughts on one of the most challenging films ever to cross the path of marketing department, Franklyn. 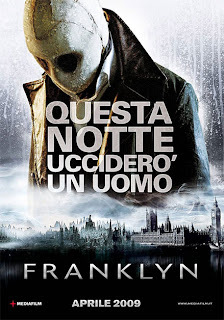 It's not hard to see why this wasn't released theatrically in the States. A weird hybrid with many masters: fantasy, quirky indie romance, psychological thriller, etc. I'm not even going to try explaining the plot. I will say that the one sheets play up fantasy element far too much. They look cool, but totally misrepresent the film. Nice character-driven, low-budget story. Don't pop in the DVD and expect to see a Stardust meets Edward Scissorhands fantasy/romance with elaborate sets and flashy effects. Props to James Cameron for suggesting to Bill Paxton that he keep the reveal until the end. No cats leaping out of cuppboards. No one investigating strange noises in skimpy underwear. No gore. Just lots of quiet tension. Feels almost Shyamalanesque -- I'm talking pre-Happening and Lady In The Water. Also reminds me of the CW's "Supernatural" a little bit. Sam and Dean's early years. Really wish Paxton would direct more. Haven't seen much from screenwriter Brent Hanley either. Great DVD as well.